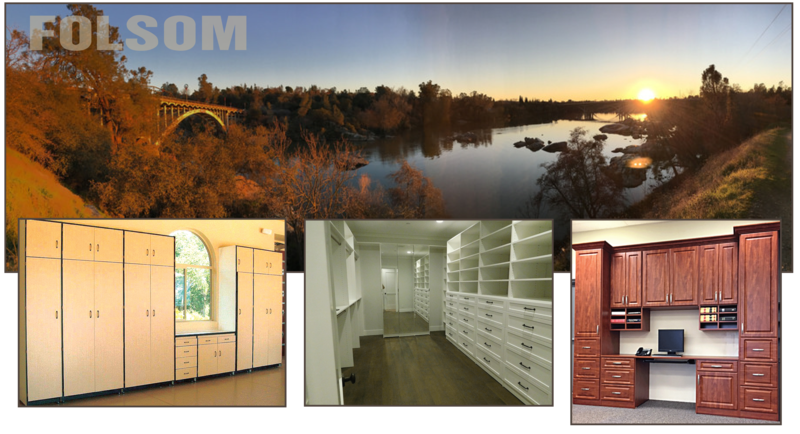 Folsom Custom Garage Cabinets | Alpine Cabinet Company "
Organize and simplify your life in Folsom with our custom garage cabinets, custom closets, home offices, and entertainment centers. As a locally-owned business, Alpine Cabinet Company has built and installed more than 32,000 custom cabinets specializing in garage cabinets, custom closets, home offices, and entertainment systems in Folsom and surrounding communities. Thanks to the support of Folsom customers, our manufacturing plant has grown into a 25,000 square foot facility where we build all of our cabinets with the customer in mind. You decide what you want and we’ll build your perfect organization and storage solution. As a pioneer in the garage cabinet industry, Alpine created a unique shelf bracket that ensures your safety while allowing your shelves and cabinets to hold more than five times the weight of an average shelf pin. Innovative custom closet designs transform your walk-in closet into a beautiful retreat and organizes your reach-in closets for maximum efficiency. Our home office expertise provides the perfect solution for your needs, whether you want a dedicated home office or a space to pay bills. Custom entertainment systems discretely hide your electronics while displaying your collectibles in style. You’ll love the custom cabinets built and installed by Alpine Cabinet Company with custom lighting, accessories, finish options, and high-quality garage floor coatings. Contact us today so we can provide you with the best storage and organization solutions. Also serving communities around Folsom such as Granite Bay, La Cresta Village, Orangevale, Fair Oaks and all the way to Truckee.